Our homes are filled with electrical appliances designed to make our lives easier and more convenient, so that we have more time to pursue more rewarding activities. We don’t need to wash our clothes by hand or hope for sunlight to dry them. We don’t need to spend hours preparing and cooking meals, only to spend another hour washing all the dishes afterwards. 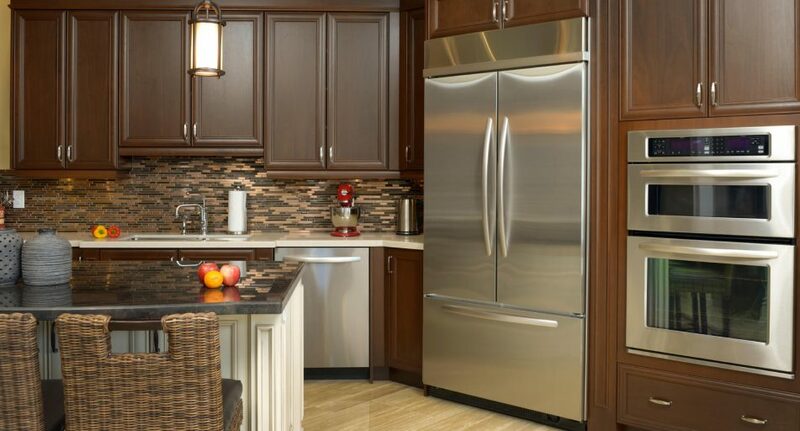 We have the modern convenience of electric lights, hot running water, and hygienically chilled food storage. However, as you fill your homes with convenient appliances, be aware that many of these modern conveniences are also potentially dangerous. Any electrical appliance has the potential to start fires or cause an electric shock, and each brings with it its own dangers, ranging from frightening to life threatening. Understanding these potential hazards can help keep you, your family, and your property safe. Here are several common appliance dangers to be aware of in your own home. The electric cord on your appliance contains a live wire and a neutral wire, both securely insulated from direct contact with water, flammable material, or your own hands. Once the cord becomes frayed, the live wire is exposed, leaving your household vulnerable to electrocution or electric fires. Frayed and damaged electric blankets are extremely hazardous, so always check your blankets before use, especially if they have been stored away during the warmer months. Check your cords regularly and replace any frayed or damaged cords immediately. If a power point switch is cracked or broken, contact an electrician; do not touch it or try to repair it yourself. Keep a written record of when your appliances need servicing so you can attend to this regularly and on time. Many appliances need to be cleaned or cleared regularly to prevent build-up of material which could ignite a fire. Regularly clean ovens and hot plates to prevent the build-up of spilt foods and pooling fats. Clear dust and lint away from the electric motors of exhaust fans. Keep a written record of when your appliances need servicing so you can attend to this regularly and on time. This way, you know any minor issues have been corrected and the appliance is still safe to use. While an overloaded circuit won’t necessarily burn your house down, it can cause you extreme inconvenience if the oven stops working an hour before dinner. Overloaded circuits can be especially inconvenient if you have an electric garage door, and find yourself unable to get your car out to go to work. Your wiring system can only handle a certain level of power, so circuit breakers (or fuses) are put in place to limit the power going through your electrical system. However, if you exceed the power demands on one circuit, the circuit breaker will shut down the entire circuit so as to prevent it from causing damage. Too many appliances taking advantage of the same circuit can lead to overloads, but as you likely have several circuits within your home, you can simply move some appliances to a different circuit, or make it a point to unplug the appliances that are not regularly in use. If you find that you are having regular short circuits, you should check every appliance carefully, to establish where the problem may be originating. Extension cords should only ever be a temporary measure—not only do they have the potential to overload your circuit, they are also potential trip hazards, and may become tangled or frayed with frequent use. Keep all electrical appliances away from water, and never touch anything electrical while you are standing in or near water, or when your hands are wet. Water is an excellent conductor of electricity, which means that if you are touching water that comes into contact with electricity, the electricity will likely travel through the water and then through your body to reach the ground—which can cause serious injuries. If an electrical fire starts in your home, use a multi-purpose fire extinguisher rather than attempting to extinguish it with water, as doing so may cause further shorts and more-intense fires. Every room of your house has its own electrical appliances with their own unique dangers. Many of these hazards are obvious when you know what to look for, although you might not see the danger until it is pointed out to you. The laundry is often a relatively enclosed space with several large electrical appliances working steadily. It can be a dangerous room for young children, so make the door child-safe if possible to prevent them entering the laundry unsupervised. Besides the usual potential danger of electrical faults combined with water, washing machines have another unique safety concern—they can be a fatal magnet for mischievous children who want to climb into the machine to hide, or tip into the water trying to “help”. Most of these incidents result in minor injuries to the upper extremities, with one study reporting that less than 10% of washing machine related injuries require hospitalization. As your dryer spins your clothes around, fluffy lint and other debris is channeled into the vent. If you do not clear out the vents regularly, the accumulated debris blocks the airflow to the dryer. This means your dryer has to work harder to extract the moisture from your clothes, and the subsequent build-up of heat and exhaust gases can trigger a fire. You know there is a problem if your clothes are taking longer to dry than usual. To prevent problems, clear your lint filter after completing each load of clothes in the dryer, and book a professional to regularly clean the dryer vent and assess whether it is still fully functioning. Be cautious when ironing while young children are playing nearby, and teach kids to understand that the iron is hot! You can purchase a simple iron caddy to store your iron immediately after use, to keep it safe from children. The most common iron-related injury is, of course, minor burns to the hands and fingers. Additionally, if someone—particularly a small child—trips or pulls on the cord, the iron may fall. If that happens, the risk of dangerous burns becomes compounded by dangers associated with a falling, heavy object. From a home safety perspective, irons are hazardous if you forget to turn them off after use—particularly if you leave them flat against a flammable surface (such as your ironing board). To avoid being distracted, don’t walk away from your ironing until the iron is turned off, and removed from the ironing board, even if the phone rings in the next room. If you do your ironing in the laundry, remember the danger of electricity coming into contact with water. Kitchen appliances are generally designed to minimise potential risks of fire or electric shock. However, the combination of regular use and poor cleaning routines will increase the dangers of fire or electrocution. Human error is said to be the major cause of electric shock, followed by faulty appliances and faulty wiring, so clean and maintain your appliances regularly, and know what you’re doing when you use them. The blender has extremely sharp blades designed to move extremely fast in order to blend or chop meal ingredients. These blades can damage fingers, even when they are not spinning, so be careful when hand-washing the blender after use. If you are blending hot liquids, there is the danger of spatter or steam causing burns, especially if you use the blender on an unstable surface. Electric beaters have their own dangers, particularly around unsupervised children who might be tempted to try for a lick of cake batter, or other mixing-treats. Make sure children understand they should not lick or touch the beaters until the appliance has been unplugged and dismantled, as they could be in danger of having their hand or tongue caught should the beaters become operational. You could risk electrocution if the body of the appliance comes into contact with water while it is plugged in. Always turn off the appliance and unplug it as soon as you have finished your task, and do not operate near a full kitchen sink or running water. Microwaving food will often heat it unevenly, which can cause food safety issues. Bacteriathrives in colder portions of food, increasing the risk of food poisoning, while overheated food increases the risk of burns. Any electrical appliances designed for food preparation can become more of a fire risk when they are not cleaned properly, as the spilt food could catch fire during the next cooking session. Clean your microwave tray and walls regularly, and always cover food before heating, so as to prevent splatter. This is a particular hazard when heating liquids such as soup, as the overheated soup could overflow, causing a mess at the base of your microwave and making it difficult for you to remove the container without burning your fingers. Never store items inside the microwave, as faulty wiring can make the microwave turn itself on, so anything inside the microwave could cook until it goes up in flames. Play it safe by unplugging the microwave while it is not in use. Toasters will catch fire if bread comes jammed in the mechanism while it is toasting. Regardless of warnings, there are still people who give themselves electric shocks by using a metal utensil to dislodge jammed bread while the toaster is still plugged in. Unplug the toaster while it is not in use, to prevent faulty wiring from starting the power, and never insert metal objects into the toaster. Coffee makers are not among the “top six” fire hazards in the home, but like any appliance, there is still a risk of electric shock from faulty wiring. And like any food preparation appliance, there is the risk of burns from steam or hot water spillage. The most common safety risk from coffee machines is the presence of mould growing in coffee maker, so it is important to clean the coffee machine regularly and thoroughly. While “gassing” was once a safety hazard with refrigerators, when piercing a hole into the freezer lining would release coolant, this is no longer a concern with new models. However, if the lining of your fridge or freezer becomes cracked, cool air will escape into the freezer wall, making your fridge/freezer work harder to maintain the correct temperature.This can overload the electrical system, and also trigger the other major safety issue with fridges or freezers—unsafe food storage. Your food must be stored at temperatures below 5 degrees Celsius or above 60 degrees Celsius to prevent the growth of bacteria, so it is important that your fridge is in the correct working order to maintain a temperature below 5 degrees. The blades in a garbage disposal are extremely sharp and designed to grind down bulky food, so never reach your hands down into the unit. A garbage disposal has the dangerous combination of sharp blades, electricity, and water, so naturally there is a high risk of electric shock, especially with older, well-used models, or if there is metal in the proximity of the running water and active garbage disposal. An older model may also start to leak, which could trigger mould growth and pest infestation. If your oven is not installed properly, heat may escpase and may not vent properly, thus increasing the risk of toxic carbon monoxide leaking into your home. You must clean your oven and your stovetop regularly to prevent fires from spilled food, sauces, or oil within the oven. It is also important to teach children safe behaviour around ovens and stoves, so they understand they are at risk of being burnt if they do not behave responsibly. Supervise children very closely, or keep them out of the kitchen if possible while you have food cooking on the stove top. Inquisitive children might try to climb up to “have a look,” and then tip over a boiling pan. Even adults could knock at the handle of a pan, causing serious injury from spills. Turn pan handles inward, and when possible use back burners rather than front ones. Toddlers and young children are particularly likely to injure themselves on kitchen ranges, where the oven and stove are combined in one unit. If the kitchen range is not installed correctly, a child climbing onto the oven door could tip over the entire range and be crushed. In the bathroom, you have the lethal threat of combining water with electricity. Take the time to arrange your bathroom carefully so electrical appliances are not within reach of the sink, and so that they can be conveniently unplugged and stored away while not in use. You could also suffer burns to your scalp from the direct heat of the hairdryer if you are not careful, or you could burn your fingers by touching the grilles within the dryer barrel even after the hairdryer is turned off. The hair dryer is arguably one of the most hazardous appliances in your bathroom, as it can be deadly if it comes into contact with running water, or if dropped into a full bath. Like any appliance it becomes more of a fire risk if the cord becomes frayed or damaged. Always unplug your hair dryer after use, and store it where it cannot fall into the sink or bath. Hair curlers and straighteners can heat up to 200 degrees, so they stay hot for a long time even after they’ve been turned off. This can be dangerous if someone actually touches the blade, or if you leave the appliance resting on a flammable surface. Heaters and lights are the “forgotten” appliances which work extremely hard for long hours without much attention or maintenance. If you monitor and service these appliances carefully, you can minimise the risk of turning them into silent fire hazards. During winter, you can get into the habit of forgetting the heater is still on. If objects such as cushions or clothes are close enough to the heater, they can over-heat and catch fire. This is even more dangerous for your household during the night, as a fire could take hold while you are sleeping, and the risks are increased if the heater has faulty wiring or a frayed cord. Some heaters release an excessive level of gases, such as nitrogen dioxide, carbon monoxide and formaldehyde, making them extremely hazardous to long-term health—particularly for people with a history of asthma. Check your heater and the cord regularly, and if you want to leave it on for long periods of time, invest in an electric timer which will shut the heater off after a specific period. Light bulbs and fixtures can be a fire hazard if they are kept on within enclosed spaces such as a closet, as the lack of air circulation combined with rising heat can trigger combustion. Water leakage from the ceiling into a light fitting can also lead to electric shock or fire. Halogen light bulbs are generally considered safe, although they become extremely hot so, there is a risk of severely burning yourself if you touch the bulb after it has been on for a long time. Halogen bulbs have also been shown to emit UV rays, so there have also been cases of people becoming “sunburnt” after spending long periods of time exposed to light from a halogen bulb. Fans are designed to be safe to leave on for long periods, although you must be careful to monitor the cord, as the fan will become a fire hazard if the cord becomes frayed. The main hazard with fans is that children can be tempted to stick their fingers in between the spokes of the safety cover. A fan’s blades are often extremely sharp and spin very fast, so little fingers can be lacerated if they come into contact. Pedestal fans can also be hazardous if kids are running around the house and run into it. Air conditioners use up a great deal of power, so they can become a fire hazard if they overstrain your wiring. The other major danger of air conditioners is the build-up of bacteria in unclean filters, which can trigger respiratory illness in members of a household. You can minimise the dangers by having your air conditioner serviced regularly and cleaning your filters thoroughly when necessary. If the valves start to leak, the heater could explode. So it is important to have the water heater serviced regularly to check that everything is in working order. Your water heater is an essential household appliance, yet it is easy to forget; if the water heater becomes damaged or corroded, it can become extremely dangerous. If the venting does not work correctly, the heater will cause a backdraft, sending toxic fumes such as carbon monoxide into the room, and this in turn could cause acid condensation onto the vent pipes. Most safety issues relating to vacuum cleaners have to do with children who hurt themselves playing with a vacuum cleaner while it is turned on. Children can be fascinated by vacuum cleaners, and may accidentally injure themselves if they don’t understand the power of the suction against their bodies. Most vacuum cleaners are fairly safe, but you will increase the risk of electrocution if you damage the cord by pulling or dragging on it. Check the cords regularly to ensure they are undamaged. Never use a vacuum cleaner designed for dry surfaces outside or on wet surfaces, as you increase the risk of creating a fire hazard. Appliances come in a variety of shapes and sizes, and help us with a number of chores in ways that would otherwise be be impossible, but they aren’t perfect. By recognizing the risks associated with appliances, you’ll be able to safely enjoy the benefits of living in a modern home. If you are looking for home and contents insurance, be sure to find the right cover for you. Get a quote with Budget Direct.